Hey Marseilles uses more instruments in their music than the number of people in the band. And when such numbers of instruments are put into the hands of musical geniuses like Hey Marseilles, you can expect to hear some amazing music. Hey Marseilles has a wonderfully unique sound about them. Ranging from Folk to Indie to Jazz with even a little Pop at times, Hey Marseilles uses a ton of instruments to make music that is chock full of depth. With nearly enough members and instruments to make an orchestra, Hey Marseilles’ music will comfort its listeners with a warm glow of rich harmony. Hey Marseilles makes music that is overflowing with harmonies, both vocally and instrumentally. The lyrics are elegantly sung and when this band harmonizes, it is sheer brilliance. Each song tends to be one giant crescendo, slowly wrapping itself around the listener. And instead of rapidly dropping off once the high point is reached, the songs gently bring the listener back down only to repeat the process with the next song. 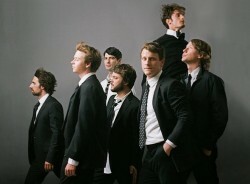 MarsBands.com suggests you take a walk on the softer side of music and enjoy Hey Marseilles.